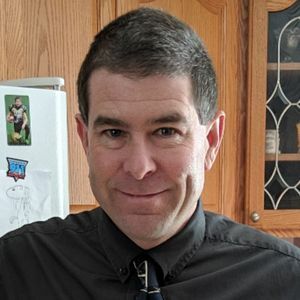 John B. McDaid, 50, of Candia, NH, passed away unexpectedly on April 3, 2019 at his home. He was born on November 10, 1968 in Brighton, MA to John and Patricia (Wilson) McDaid. He married his beloved wife Doris at St. Pius X Church on April 16, 2005. He was raised and educated in Massachusetts, later receiving his Bachelor's Degree in Business from Merrimack College. John was a Senior Customer Service Representative for Graybar Electric. John enjoyed time spent with his family 4 wheeling, golfing, going to the lake, camping, and fishing. He loved the outdoors, and he absolutely adored his two children. He will be deeply missed by all those who knew and loved him. John was survived by his wife Doris (Bouchard) McDaid; his two sons Scott and Matthew McDaid; his parents John and Patricia McDaid; his brother James McDaid; his sister June Fahey; his father-in-law and mother-in-law Denis and Debra Bouchard; his sister-in-law Cristy Martin; and many aunts, uncles, nieces, nephews, and cousins. SERVICES: Calling hours will be held from 4-7 pm on Monday April 8th at Phaneuf Funeral Homes and Crematorium, located at 243 Hanover St. Manchester, NH. A Mass of Christian Burial will be held at 10 am on Tuesday April 9th at St. Pius X Church, located at 575 Candia Rd. Manchester, NH. Private burial will follow at a later date.